From the 80’s, Carlotti G. &. C. deals with the production of potato machines. Constant contact with farmers has led to the creation of models that have evolved and improved in keeping with the latest technologies. Located in Budrio, common of the metropolitan city of Bologna, the workshop Carlotti G. & C. produces today over 15 models of manual, semi-automatic and automatic machines for planting, digging, harvesting, cleaning and selecting potatoes and onions. Seriousness, precision, competence and quality have led the company to 27 foreign countries. Potato machines are extremely reliable for the quality of the materials and the robustness of the structure. The Green and Spring series are designed for harvesting without damaging the fresh product. This innovation translates into a commercial advantage for the customer. The potato digger is an agricultural machine driven by the tractor or connected to the three-point hitch. It is used to dig the potatoes from the ground with the aim of collecting them. The potato digger-harvester carries out with a single passage both digging and harvesting: the tubers, instead of being unloaded on the field to be harvested, are placed in a container or conveyed to a side elevator. 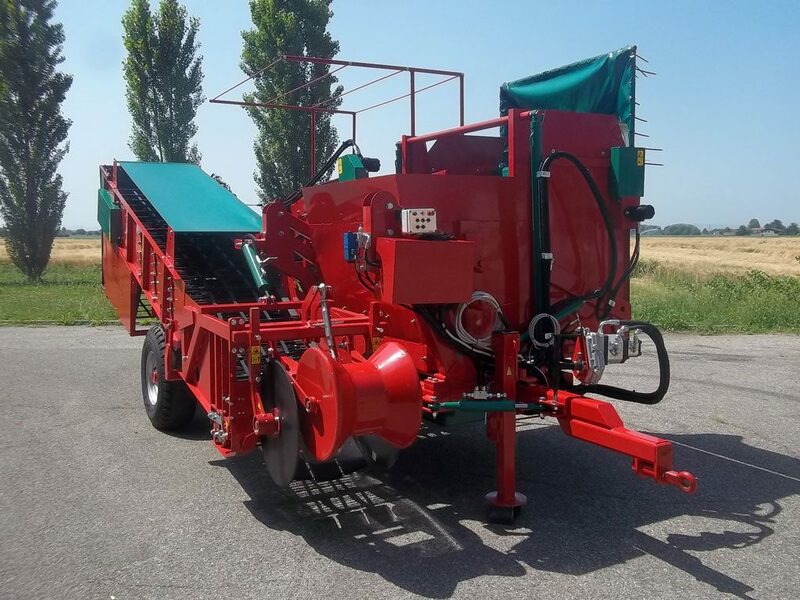 Carlotti G. & C. deals with the production of potato diggers KMC model, an agricultural machine designed and built to dig one or two rows of potatoes. Due to its characteristics, KMC is used to dig a tender, mature product and also for field heads. On request the machine can be supplied with second belt, rubber shakers, rear discharge with oscillating grid and cardan shaft. It is our automatic potato planter for 2 rows used for sowing tubers or bulbs. Attached to the three-point hitch of the tractor, it allows to vary the seed depth by acting on the upper arm of the third point. 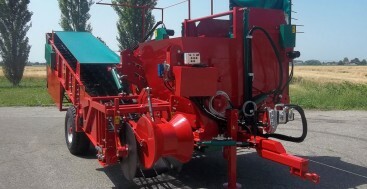 Equipped with standard electric agitators in the seed descent chute, motion transmitted through the side support wheels and transmission of load belts through the chain connected to the wheel shaft. Carlotti G. & C. deals with the production of warehouse machines CSS 600/1700 series. These machines can select, brush and ground the potatoes before the packaging phase. This model is positioned on four removable and adjustable supporting feet. To vary the working height, simply act on the fixing screws of the fastening structures and remove the supporting feet. The sorters are driven by the gearmotor. Simple but robust agricultural machines, helpful and skilled personnel, a professional company at customer service: these are the features that make Carlotti G. & C. one of the best Italian companies in its segment.